The A' Art Materials, Stationery Supplies and Gift Items Design Awards is organised yearly by A' Design Award and Competition in pursuit of recognising excellent art design projects from industrial product designers, art material suppliers, stationery supply producers and gift product manufacturers worldwide, that were proposed and completed within the last 10 years. Every year, the A' Art Materials, Stationery Supplies and Gift Items Design Award Competition features a reputable jury panel of specialist in art design in order to evaluate design projects submitted to A' Design Award. The following are some example design projects which could be submitted to the A' Art Materials, Stationery Supplies and Gift Items Design Awards: adhesives, artists supplies, non electrical tools, staplers, binders and more. The first phase of A' International Art Materials, Stationery Supplies and Gift Items Design Awards is the preliminary round where designers submit their design works for preliminary evaluation. Art materials, stationery supplies and gift items design projects that have received a high preliminary score in the preliminaries can proceed with nomination. While the registration and substitution a design work for the preliminaries is free of charge, there is a fee for nominating entries for the finals. Late deadline for entries to the A' Art Materials, Stationery Supplies and Gift Items Design Awards is on February 28, 2018 and winners of the competition will be announced on April 15, 2018. 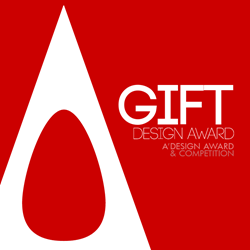 Laureates of the International Art Materials, Stationery Supplies and Gift Items Design Awards will be honored the highly valuable A' Design Prize which contains a series of PR, marketing and publicity tools for promotions as well as exclusive trophy, excellence in design certificate and Award Ceremony invitation in Como, Italy.